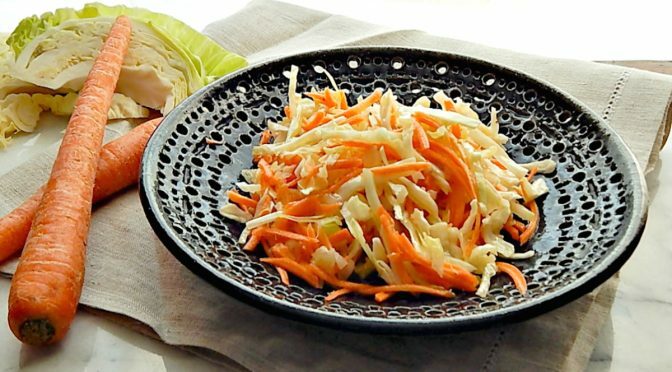 Carrot & Cabbage Slaw is one of those recipes you can whip up in any amount or for any meal. It’s so simple, it’s easy to remember and so quick it can be whipped up at a moment’s notice. This easy recipe becomes second nature as long as you remember equal parts vinegar and oil and a little bit of sugar & salt to taste along with a little dry mustard & celery seed. This little slaw is vinegar, not mayo, based so it keeps well for several days with no worries about weeping or any separation. Best of all, it just keeps on getting better as it sits. It might seem just a bit dry when first mixed up but will get a little juicier as it mingles with the juices the vegetables give off. What’s a detriment in mayo-based slaws is a plus in vinegar based ones. The dry mustard is what really “makes” this recipe, even though it’s a relatively small amount. I include it in my Top Secret Super Stealth Arsenal of Ingredients list. I love the way dry mustard works so well with any recipes that contain vinegar, whether it’s salads, slaws or potato salads. If you’re not all that keen on carrots or you’d like something else in your slaw, maybe purple cabbage, apples or other crunchy veggies, just play with the ingredients and proportions to suit your taste. You’ll want to be careful with adding any onion because onion will grow stronger in taste with time. If you’re going to be eating all your slaw at once, vidalia onion is a great addition, though. Any cabbage keeps well in the fridge and even sliced or shredded cabbage will be fine for days. If you’re planning on making something else to use up the rest of the cabbage, just prep it all at once and keep it in a Ziploc. Shredded carrots won’t be as nice for as long but if you’re making salads and love to toss shredded carrots in them, put a paper towel in the bottom of a container and place the shredded carrots on top. Cover tightly and you’ll be fine for three or four days. When shopping for cabbage, really pay attention to the pricing and whether or not it’s by the head or by the pound. Cabbage tends to be heavy so if sold by the pound you might be surprised at the register. The pre-shredded cabbage is convenient, but you’ll pay four to 10 times more than buying your own cabbage & carrots. There’s a reason those bags are priced by the ounce instead of the standard by the pound produce pricing for vegetables. It makes it difficult to compare and keeps you from realizing how pricey they are. If your cabbage gets discolored around the outer leaves or the edges if it’s cut, just remove the bad parts; it should be just fine underneath. If you’re going to trim the discolored cut edges of the cabbage and store it again, clean your knife after each cut and it will stay fresher, longer. When carrots are on sale, pick them up. They’re another vegetable that keeps very well. Don’t let them just sink to the bottom of the drawer in the fridge where they’ll collect moisture and rot. Open the bag a little to let out any condensation, and move the bag around from time to time as it sits in the fridge. Larger bags of carrots are usually less per pound than the one pound bags. Be wary of the “baby” carrots which are generally just peeled and cut larger carrots and dried out even though they’re soaked in an ammonia or bleach solution. I avoid them even if they don’t cost as much as normal carrots. A quick vinegar based slaw, bright and tangy. Add cabbage and carrots to a medium-sized bowl. in a small bowl, mix rest of the ingredients. Pour over the cabbage mixture and toss. This salad is best if it’s made a little ahead. 10 to 15 minutes is good, but an hour is better. This recipe is a part of my Chicken Breast Meal Prep. I’ll be bringing this recipe to Fiesta Friday #214, hosted this week by Abbey @ Three Cats and a Girl and Antonia @ Zoale.com. There’s always a lot of great bloggers & a lot of great recipes at Fiesta Friday and I couldn’t help but notice a few St. Paddy’s Day recipes being posted! This entry was posted in Click here for Fabulous Food Posts and tagged Cabbage, cabbage slaw, Carrots, Meal Prep, Salad, Side, side salads, Slaw, Vegetable Side, Vinegar. Bookmark the permalink. I’ve been trying to eat more salads and this was a good one. Thanks Rhonda! 🙂 I’ll have to eat more to make up for those nachos and guinness brownies, lol!! I get that! xox Mollie. Hi Antonia, and thanks – and sorry for the late reply! Is this now a self-hosted blog? Looks a little different around here. Good for you and may your new endeavor be successful! Love all your tips, Mollie, I always learn something new. This time it’s about onions growing stronger with time. I still remember your tip about not storing potatoes and onions together. I was always shocked to see how fast my potatoes sprouted. Duh I stored them with onions!! Not anymore! Oh? What kind of problems? Just in case I can help. Mostly, I couldn’t get a pin plug in to work right, and the one I used to use always used to work! I think that’s fixed now, or will be. Now I’m just not sure about the recipe editor! What do you uese for a recipe editor? I seem to remember you had some issues awhile back…. I use EasyRecipe, the free one. I like their design the best and it’s one of the most popular, but lately I’ve had problems since I upgraded my WP software, pretty sure it’s compatibility issue, but I solved the issue myself. I just went to my older recipes, copy the HTML codes and paste that on the new post. Taking a few more steps, yes, but the creator of the plugin has stopped responding to questions (health related issue on his part) so I never contacted them. I’m with WordPress and am seriously thinking of going to bluhost. My brother looked into hosting me, but says there’s a LOT that has to go in to it. Can I ask, do you self host on a computer at home or use a company? I’m a little afraid to take the plunge. I have a web host, if that’s what you’re asking. It’s InMotion hosting. I chose them for their customer service which I’ve been happy with so far. But I’ve heard good things about Bluehost too. Jhuls is trying to go self-hosted too, with host gator I think. I didn’t come across serious problems when I started selfhosted. The process was pretty simple actually. If I could do it, so can you! Very pretty. Good tip on the pricing. I once got caught out with a bag of grapes. I thought the price was per bag not pound. I had the cashier to take that off my groceries. It was very expensive! I almost bought a seven dollar honeydew!! Thanks, it is! It’s hard to find good decent veggies in Minnesota this time of year, but you can always count on carrots and cabbage!